This a link to an edited version of the Elluminate Live! broadcast I held on May 18, 2010 for Wilkes course EDIM514. It was a great experience to host and manage a live session and discussion. Thanks to those who were able to participate. The first half of the video is my presentation and the second half is the ensuing discussion. Enjoy the broadcast and add your comments to the Blog. Resources- here are the links and resources I referred to or resources I consulted when preparing my broadcast. Will Richardson’s Google Map- What do you Block? 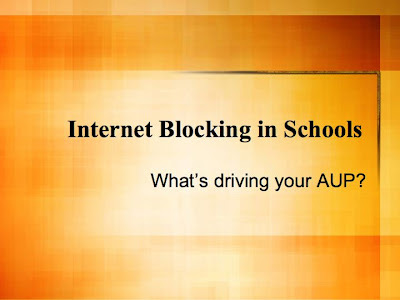 Internet Blocking in schools- What’s driving your Acceptable Use Policy? The Link to the Elluminate Live archive original of this broadcast is here. What’s the purpose of blocking Internet content in schools? The Google Map below is a collection of data points coded green, yellow and red depending on whether Internet content is wide open, filtered, or completely blocked in a school or school district. The map was created at the request of noted 21st century technology and educational writer, speaker and blogger Will Richardson. Richardson is author of Blogs, Wikis, Podcasts and other powerful web tools for the classroom. Have a look at the map. Are there patterns in the choices that Districts and schools have made about Internet services and how they are delivered, or in some cases, NOT delivered them to their staff and students? What’s the policy where you work? There is a growing body of research that suggests this may not be the way to go. Read on below. A recent report for OFSTED, the UK government’s educational standards office, claims that students in schools that have their Internet locked down are far less able to manage their own safety due to lack of experience in making appropriate decisions. The report, The Safe Use of New Technologies, pointed out that that exemplary schools that had managed, open access to the Internet also had a plan for developing critical literacy and e-safety that were collaboratively developed by the school, administration and the community. Other writers and bloggers have taken up the issue as well. In Computerworld’s online edition, the point that filtering has now become “soft censorship” is well made. Instead of teaching students what to do when objectionable or questionable material is encountered, it’s easier to just block it out. What invariably happens is that useful material is blocked too, in what amounts to throwing the baby out with the bathwater. Recently, a well respected Canadian history magazine had to change its name. It seems as though its title, created almost a hundred years ago by the Hudson’s Bay Company, who published the history review at the time, was increasingly being blocked by school and library internet filters, as well as email spam filters. Teachers were often unable to receive materials from the magazine via email. A change of name was inevitable. By the way, Canada’s History magazine is a wonderful resource for any school library. More incidences of how Internet filtering has blocked useful material from being accessed are being published around the blogopshere. Doug Johnson, a Minnesota school district Director of Media and Technology who also writes the Blue Skunk Blog, recently conducted a Twitter poll that turned up hundreds of examples of how Internet blocking unintentionally censored good information. The list goes from the silly, to the unimaginable. So what are teachers to do? Maybe we need to be more proactive about who sets the criteria for blocking in our District, and about requesting copies of the criteria that are used to set the filtering, as well as the process by which it is conducted. Johnson discusses a number of very proactive steps we can take when the powers that be make teaching and learning in the 21st century a difficult challenge. I suggest we take this bull by the horns. The best way to teach a person how not to drown is to give them swimming lessons. Maybe this is the approach that needs to be taken in the huge ocean of information we call the Internet. A great Blog on the ISTE site addresses the Internet Filtering issue in great depth. There are a considerable number of links to research, commentary and opinion about the topic. Read on! Let’s tackle this issue where we are and make the powers that be more familiar with the challenges, benefits, and outcomes of more open Internet resources in schools. I have been using ePals in the classroom for almost 15 years, since it was in its infancy. The leading edge, innovative technological tools that it provides teachers, students, home-schoolers and parents around the world, are excellent means for students to develop communication skills and creative content. Available in more than seven languages, classroom teachers around the world can connect their students one with another in simple email exchanges, in complex collaborative projects, in the sharing of text, sound, and video products. What makes the exchanges unique is their authentic nature. Students learn from each other through instant Internet communication. No longer separated by a classroom walls, or by the distance to another school district, province, state, continent or country, students develop rich understandings of the similarities and differences between themselves and their peers near and far. The only barrier is the time separating linked classrooms. As a teacher always looking to push the limits of what technology can do, I have been able to use ePals in my classroom to link students in the exploration of literature. Students in different countries read and discussed the same novel. Remote Man, a novel, is about students in different countries, not coincidentally, who become involved in catching an international endangered animal smuggling ring. The characters in the novel gather on the Internet to track down the perpetrators from their homes in Australia, America, Jamaica and France. Students in my class quickly became engaged with the novel as they read and discussed the plot, characters, settings and themes. Their engagement was increased when they shared emails, artwork, points of view and questions. They also participated in live text chats with their classmates across the oceans. The author, Elizabeth Honey, kindly agreed to join in the discussions. Her presence in the online chats contributed greatly to their success, and inspired further student learning. Students wanted to know more about her reasons for writing the book, as well as how she crafted the characters, the settings and the story. On one occasion, the author, at home in Australia, discussed the book with the class, in the school’s computer lab, along with a home-school family in the Highlands of Scotland. One student, on holiday in Saudi Arabia, also joined in. Separated by 14 time zones, the students and adults learned from each other in the moment. To add another personal highlight of my experience with ePals, I look back to 1999. My class was chosen to host the Prime Minister of Canada to showcase ePals for Netd@ays Europe, a way to demonstrate Canada’s leadership in the use of the Internet in schools. This event involved the Prime Minister visiting the class, sending emails to our class partners in New Zealand, followed by an address to the whole school about being citizens of the Global Village. This was, without a doubt, a career highlight! Having had classroom partners in the USA, France, the UK, New Zealand and Australia, I can attest to the fact that my students truly understand what it means to be residents of the Global Village, and are better people because of these experiences. Honey, Elizabeth. (2004). Remote Man. New York, Yearling.